Ice skating pants with "Biellmann" rhinestone applique. Sparkles with AB clear crystals. - design size: 5 inch x 9 inch. - available in child and adult sizes. - Polartec power stretch fleece and non fleece Supplex microfiber option available. 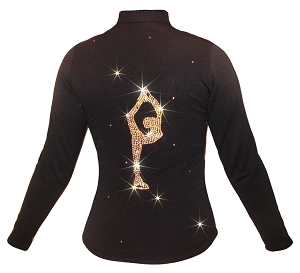 Hit the ice in professional and sparkly ice skating pants and enjoy your practice!